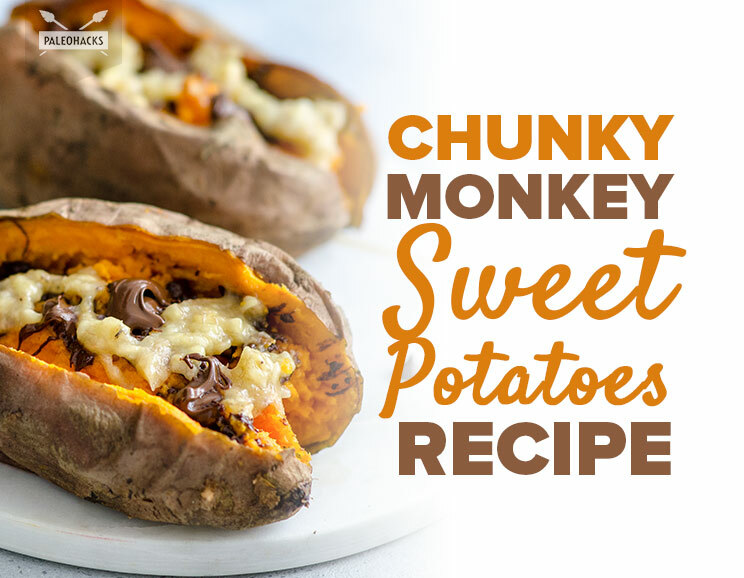 Satisfy your sweet tooth with Chunky Monkey Sweet Potatoes loaded with sliced bananas and dark chocolate. 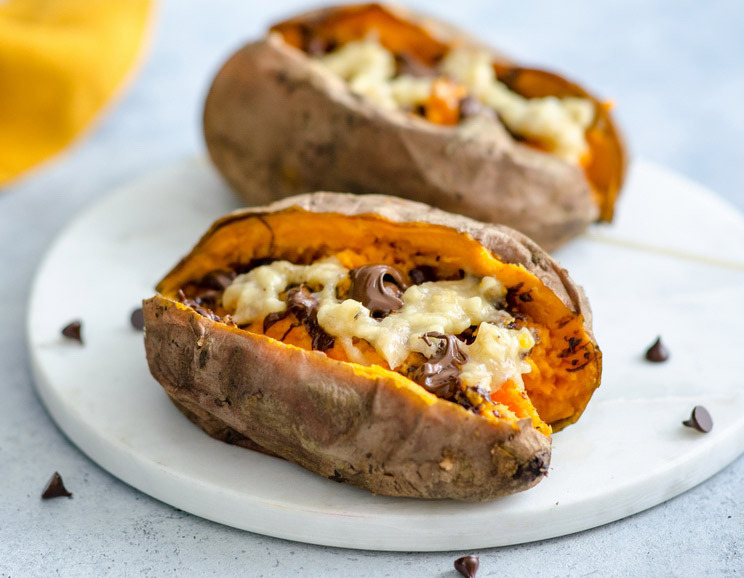 Warm up to these ooey-gooey sweet potatoeswithout the guilt! Made with five natural ingredients, these spuds use zero refined sugars and are completely dairy-free. Serve them as dessert or make it whenever you’re craving a chocolate-loaded snack. It’s easy to make and requires minimal effort to get started. 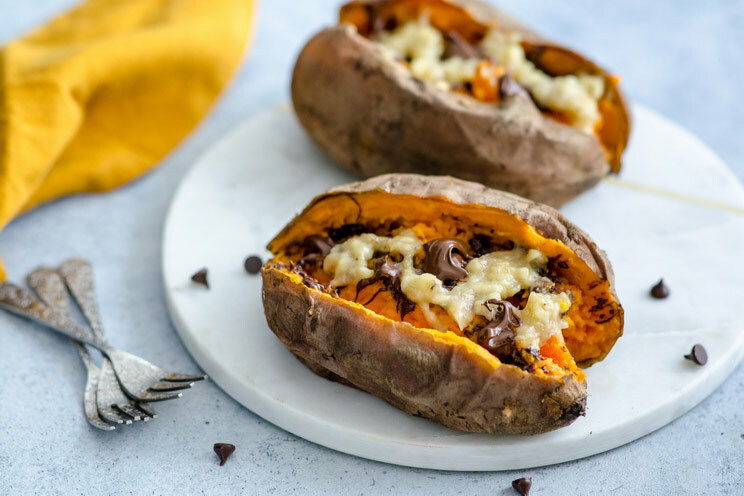 Sweet potatoes are a good source of fiber and have a healthy heaping of prebiotics to heal your gut. Combined with dark chocolate chips, this recipe is bursting with “sweet” flavor to kick sugar cravings to the curb. Keep things dairy-free with a rich glaze made from coconut cream and mashed bananas as an added bonus. To get started, rinse and dry sweet potatoes thoroughly. Use a fork to prick them liberally and wrap them in foil before baking for 40-45 minutes. When ready, remove them from the oven and let them cool for 10 minutes. Slice the potatoes lengthwise and use a fork to mash up the insides. Gently mix in half a tablespoon of maple syrup into each one, then add the banana slices and chocolate chips. Pop them back into the oven to caramelize for 10 more minutes. Meanwhile, begin making the glaze by mashing together half a banana, almond butter, and coconut milk. Tip: For a thinner glaze, add two teaspoons of coconut milk. Remove sweet potatoes from the oven and slather glaze on top. Add maple syrup, pecans, or any other Paleo-approved toppings for extra fun! For the Sweet Potatoes: Wash the sweet potatoes and dry with a paper towel. Prick them liberally with a fork and wrap them in foil. Place them onto a baking sheet and bake for 40-45 minutes, or until fork tender. Set aside to cool for about 10 minutes. When ready, slice open each sweet potato lengthwise. Use a fork to carefully mash up the flesh, leaving the skin intact. Gently mix in half a tablespoon of maple syrup into each one. Next, add banana slices and chocolate chips evenly into the center of each spud. Place back into the oven for 10 minutes. For the Banana Glaze: Mash together half a banana, almond butter, and coconut milk. Mix until smooth and creamy. You can add two teaspoons of coconut milk to thin out your sauce, if necessary. Remove sweet potatoes from the oven and drizzle with glaze on top. Add maple syrup, pecans, or other Paleo-friendly toppings.